People often gravitate to Chihuahuas because they're cute and small. 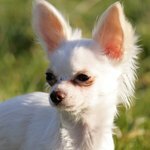 Many Chihuahua owners don't train their puppies because of their small size, but breed expert Barbara Scott recommends instilling and enforcing rules to create well-behaved pets. To facilitate training, first make sure that your Chihuahua receives enough exercise to burn off extra energy. For many Chihuahuas, playing fetch around the house will suffice. However, if you notice your dog is behaving especially poorly, try taking him for a walk around the block. The walk will also give you and your Chihuahua puppy a chance to bond. Say "no" firmly when your Chihuahua puppy behaves inappropriately. Avoid shouting since dogs can react to your energy. Speak calmly, firmly and assertively. Establish rules for your chihuahua and make sure everyone in the family follows the rules. If your puppy isn't allowed on the couch, make sure your family members don't let the dog sneak onto the cushions. Allowing your Chihuahua to break the rules prevents him from learning what they are. Splash your Chihuahua with water from a spray bottle if he continues to misbehave. The water can surprise your puppy into submission. After he quiets down, ask him to do a trick, such as sitting, and then reward him with a treat for sitting. Remain calm, no matter how mad your chihuahua makes you. Growing angry or hitting your dog will only exacerbate his behavioral issues.